The organizers of SPIE Defense + Commercial Sensing 2019 have announced further details of the presentations and technology planned for the 4 day exhibition. 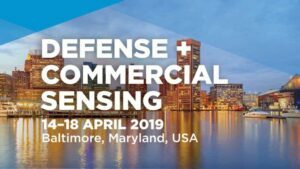 Taking place at the Baltimore Convention Center in Baltimore, Maryland between 14 – 18 April, SPIE Defense + Commercial Sensing will feature 50 conferences with 1,600 presentations, 30 courses, and a 350-company exhibition. Attendees will hear from leading researchers speaking about sensors, infrared technology, laser systems, spectral imaging, radar, LIDAR, and more. Includes topics such as IR materials, image sensors, photon counting, energy harvesting, and quantum technologies. The applications include wearables, cybersecurity, information processing, energy storage, and drones. Addresses topics such as spectral imaging, computational image processing, metrology, and 3D imaging. Papers include applications in security and defense, climate monitoring, big data, deep learning, machine vision, target discrimination, and tracking. Includes topics such as fiber optic sensors, radar, laser radar, IR technologies and thermal imaging. Applications include security, structural sensing and health monitoring, non-destructive inspection, tracking, and ranging. Highlights cutting-edge research focused on emerging technologies for specific applications such as autonomous systems, CBRNE, agriculture and food safety, Cyber-Physical Systems/IoT, and more. Register to attend to learn about the latest technical advancements, find new business opportunities, and collaborate with other experts working on materials, components, systems and analytics for defense and commercial applications in sensing and imaging.